At NAB 2011, DVS will present its flagship product CLIPSTER® packed with the latest features. Along with support for mezzanine formats, CLIPSTER® now also features extended DCI Mastering support for 3D projects. At DVS’s booth SL3305, NAB visitors will discover how CLIPSTER® can optimize their workflows. DVS will be showing the new features that CLIPSTER® offers including extended mezzanine workflow support for IMF and MXF AS-02. The newly integrated batchlist function allows quick and automated processing of DCI/IMF and other deliverables. Plus, thanks to automatic 3D correction, stereoscopic material can be edited at maximum speed. CLIPSTER® also facilitates convenient processing of RAW material from the ARRI ALEXA camera, enabling subsequent control of camera parameters during post production. Right on time for NAB 2011, CLIPSTER® now also supports mezzanine formats such as IMF (Interoperable Master Format) and MXF AS-02, enabling post production customers to add different tracks such as video, audio, subtitles and closed captions to a digital master in accordance with the IMF format for the first time. The subsequent generation of deliverables for DVD, Blu-ray, SDTV, HDTV, IPTV and many other formats takes place at high speed. CLIPSTER® compresses JPEG2000 RGB/YUV data faster than real-time at a bit rate of 500 Mbit/s. The batchlist function integrated into the DI workstation allows independent and automated processing of DCI/IMF and other deliverables. CLIPSTER® also features an enhanced toolset for the area of 3D. 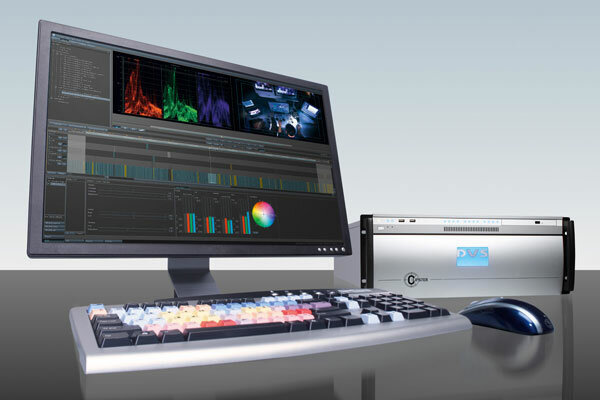 With its high-quality hardware, CLIPSTER® generates 3D DCPs (Digital Cinema Packages) in real time, speeding up 3D subtitling in 4K as well as DCI Mastering. The newly integrated STAN (Stereoscopic Analyzer) software in CLIPSTER® is a correction tool that can be used both on an automated basis and manually. STAN analyzes and corrects the 3D material in real time, resulting in significant time savings. CLIPSTER® now also processes RAW material from the ARRI ALEXA camera and supports relevant camera parameters. The DI workstation combines the RAW data with other file and video formats, in doing so ensuring a flexible workflow for data processing. In addition, CLIPSTER® handles the new 2K formats offered by the Sony SRW 5800/2.